Nikko wo minakereba “kekkō” to iu na. as “Don’t say ‘magnificent’ until you’ve seen Nikko”. Nikkō is a small town North of Tokyo at the entrance of Nikko National Park, most famous for World Heritage Site Toshogu Shrine and the mausoleum of Tokugawa Ieyasu, the founder of the Tokugawa shogunate, the first shogun of a long line. It was him who unified the country and his heirs kept power for 250 years after his death. 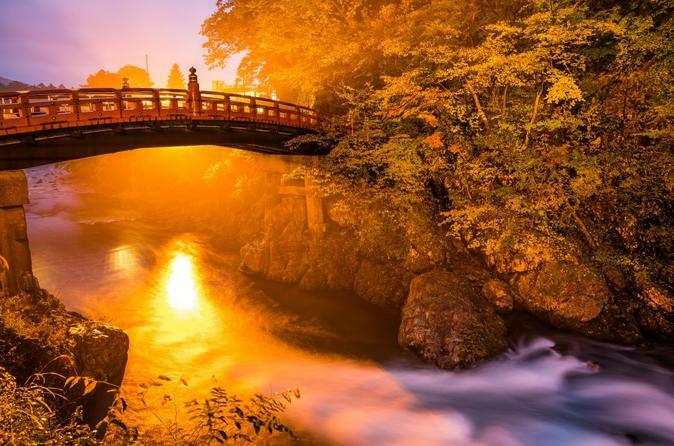 Also known for its beautiful autumn colors (Koyo), your local expert will guide through the Nikko National Park which offers scenic, mountainous landscapes, lakes, waterfalls, hot springs, hiking trails and wild monkeys. And of course the World Heritage sites. The city of Nikko has various types of onsen that offer different atmosphere, overflowing with an abundance of deeply satisfying hot water of good quality; an overnight stay at a ryokan/onsen is also recommended.